Our town offers a distinct opportunity for local cycling enthusiasts to prove their prowess and grit by trekking to the hillsides and the rural country which is literally straddling the broad shoulders of mighty Mt. Isarog. More than many times, the asphalted roads turn to gravel roads then trails, then eventually the vast uncharted land. Some villages of the town are located on this part of the dead volcano, which local folks regard as the “navel of the world” due to one particular tale. It goes like this: one man dropped a marked object designed to float on the mountain’s cratered lake and much, much later found the same somewhere in San Miguel bay towards the vast Pacific Ocean. But of course, the story is more mythical than true. But for the cyclists, myth or no myth, the experience is always exhilarating. It gives them the kind of “high” and accomplishment once they reach the goal and what was left is the opportunity to marvel at the sight- either the lush vegetation or the absence of it, and the commanding view of the area and beyond and below as far as the eyes can see. Or explore the place by foot when the wheels can’t navigate the rugged uphill/downhill tracts no more. For sometime now, our cousin Tony has been going with his friends on treks like this, and good enough, always bring his trusted digicam and capture the moments. By this post, he joins our blogging team by sharing his many photos. A very common whistle stop for the crew is a refreshing snack of fresh harvest of young coconut fruit. Both the coco meat and water tastes cool and sweet. On this particular jaunt, they challenged themselves to the high rolling landscape of Comaguingking. The village has a population of 1,518 (as of the 2007 census) with main source of income derived from farming and the reliable coconut plant. This is my post for This is My World. Many thanks to Klaus, Sandy, Wren, Fishing Guy, Louise and Sylvia for hosting this wonderful meme: My World – Tuesday. 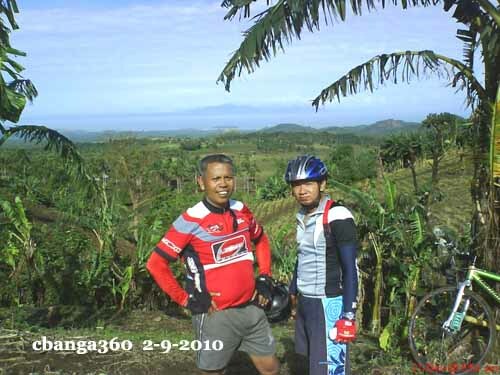 This entry was posted in BICOL NEWS NOW, NEWS, PEOPLE, WEATHER STORIES and tagged Calabanga, sports, trekking. Bookmark the permalink. a very interesting post about your side of the world! Great photos! Looks like everyone is having a great time! Beautiful place! Hope your week is going well! That looks like a challenging route for cyclist and such a beautiful countryside. i’d go for the buko drink but not the mountain biking. I’d rather walk hehehehe! I like the story of the Mt. Isarog, mythical it may be. My world entry is here. Beautiful shots. A lovely place to do cycling. I can imagine the adrenalin experienced here. Nothing rewards better than beautiful scenery at the end, besides reaching the end, of course. Looks like a great adventure! It must be so fun group cycling. I wish I were half-way coordinated on a bicycle. I was 12 before I could ride without training wheels! This looks like an incredible place. Just amazing. That’s a great, fun shot. Coconut is so refreshing and delicious. Thanks for the comment on my blog. It looks challenging and beautiful. And with coconuts en route too… lovely! The juice from the young coconuts is a refreshing reward for the cyclists. I missed the young coconut fruit with milk and ice!